Batman 12 oz. Acrylic Travel Cup: Let Batman keep your drink insulated! This Batman 12 oz. 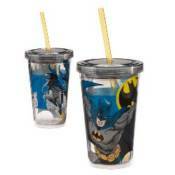 Acrylic Travel Cup features multiple images of the Caped Crusader doing his thing around the Gotham area. Featuring a sturdy plastic straw and lid to keep you from spilling, this awesome travel cup will also insulate your beverage and can hold up to 12 ounces of liquid.